The primary function of the Anthropology Division’s Objects Conservation Laboratory is to ensure the preservation of the collection for the future. The conservators’ main activities include examination, documentation, treatment and preventive care, supported by research and education. A relatively small number (200 to 450) of Anthropology Division objects are selected yearly to receive full conservation treatment (or what we sometimes call active conservation). These are generally objects chosen for loan to other institutions for exhibits, or for use in temporary or permanent exhibits generated by the American Museum of Natural History. Routine maintenance of the permanent exhibits takes place on an irregular basis, in coordination with the Exhibition Department. Conservation treatment involves thorough examination and written and photographic documentation of the condition of the artifact before and during treatment, as well as a record of its condition as a result of the treatment. In order to carry out responsible conservation treatment an understanding of the chemical nature and the deterioration of the materials of manufacture is required, as well as of the repair materials and processes themselves. Also important to the treatment process is research of the use of the object in its original cultural context. Changes that may have taken place to the object due to damage or repair during use and changes that occurred to the object later while in private collections or in the museum must be distinguished. New treatment materials and procedures are continually being sought and evaluated. Facsimiles of possible methods or materials are frequently made and tested in order to support treatment choices. Accelerated aging tests are regularly carried out as another method to try to evaluate materials for treatment and storage use. The field of Conservation Science further supports and informs conservation treatment, as part of its function is to perform more advanced analytical assessments than can be routinely carried out in most conservation laboratories. In the area of preventive conservation, Anthropology Division conservators work with collections managers, exhibition staff and curators to formulate and help implement standards for safe exhibit, travel, and storage environments; for pest control; for handling and maintenance procedures; and for emergency preparedness and response – all of which will help mitigate against deterioration and damage of the collections. The Anthropology Division objects conservation staff currently consists of four permanent conservators who have received graduate level training. For large projects additional staff members are added as required. The laboratory regularly provides internship training to individuals registered in or who have completed formal graduate training in conservation. Seven Conservators in the Anthropology Conservation Lab spent nearly one year preparing over 300 artifacts for the exhibition "Body Art: Marks of Identity". The archaeological and ethnographic objects included in the exhibit cover a wide range of materials. Conservation treatment involved cleaning, stabilization, and restoration, as well as identification of materials and technologies to supplement background information in exhibit labels. Upon completion of treatment, the conservation staff worked closely with exhibit designers and preparators to create safe and stable exhibit environments. This step involved setting environmental standards for light levels, relative humidity and temperature as well as collaboration with exhibit staff in designing cases and mounts. The shield is carved from wood and decorated with paint and hair bundles. Using polarized light microscopy, the hair was identified as human by comparing its scale patterns and structure to known samples of human hair. The surface of the shield was covered with a layer of dirt. The conservation treatment began with an overall cleaning to reduce surface dust and dirt. Cleaning involved a light brush vacuum and was followed by removal of more firmly adhered dirt using a non-vulcanized rubber eraser. This step requires great care, especially when cleaning more fragile painted surfaces. Structural instabilities were limited to the hair bundles that were matted and brittle causing excessive hair breakage and loss. This condition was exacerbated by poor storage environments, i.e. high light levels and/or fluctuating temperature and relative humidity as well as insect activity which left the hair matted, tangled and fragmented. Storage beneath heavy plastic sheeting has flattened the originally curved bundles, detracting even more from their original appearance. Insect carcasses and frass were picked out of hair bundles with tweezers and the bundles were untangled with a bamboo pick. Then the bundles were reshaped. To accomplish the hair needed to be humidified using very controlled methods and dried slowly in the new, desired position. 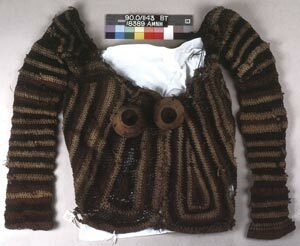 This costume is made from plant fiber string that is dyed different colors and looped (a type of knitting) into a fabric to form a shirt and leggings. The breasts are carved wood and the skirt is made from cane beads threaded onto plant fiber string. The shirt and leggings had many tears that probably occurred during use in ceremonial dancing. A particularly bad tear along the front neckline of the shirt had been repaired, possibly by the wearer. The repair involved rough, irregular stitching with cord that was pulling the surrounding fabric. The repair distorted the shape of the shirt. This damage area was humidified to make the shirt more flexible and the old repair carefully removed. Large areas of the neckline were reconstructed (re-looped) using the existing plant fiber string from the tear edges; the holes were reduced and the neckline reshaped to match the other undamaged area of neckline. 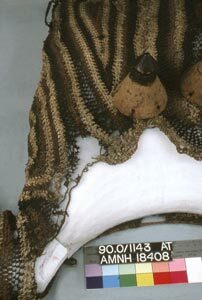 A very fine gauze polyester lining was stitched to the ripped area to provide it with additional support. 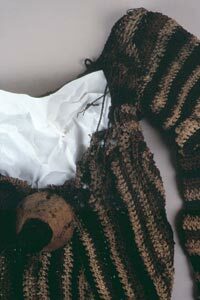 The black dye used on the plant material, possibly an iron based dye, is becoming acidic with age and is gradually attacking the plant material, making these portions of the fabric very fragile. All holes were stabilized mechanically by using colored cotton thread to secure the broken loop elements to nearby strong elements. To safely display the costume a multiple component mannequin was designed and constructed with the combined efforts of a sculptor, museum preparator and conservator. Due to the fragility and inflexibility of the fabric the costume could not be pulled over a form - like a mannequin. Instead an internal support made of five separate carved forms for the torso and four pieces for the legs was constructed. A brass armature consolidated the mannequin components. The skirt was mounted differently due to its weight and lack of form. The waistband was sewn to a padded brass hoop and the skirt body rested on a sloped Plexiglas board. The environment in which objects are stored and exhibited can substantially effect their stability. • High temperatures and light levels accelerate chemical reactions and can increase the speed of degradation. • Fluctuating relative humidity can cause damage to organic materials by causing dimensional change and to inorganic materials by causing efflorescence of soluble salts. • High relative humidity will corrode metals and can cause molds to flourish and low relative humidity will cause organic materials to become dessicated and weak, leading to cracking and other structural damage. • Pollution from industrial sources and from paints, wood and other construction materials can effect the chemical stability of objects. While ambient temperature and relative humidity can be safe for many objects, more tightly controlled environments may be needed for others. Exhibit and storage conditions may be achieved by relatively simple measures such as introducing the use of air conditioning, humidifiers and de-humidifiers, and silica gel in enclosed containers. A range of 68 to 74 degrees Farenheit and 40 to 55% relative humidity is generally considered acceptable for the majority of ethnographic and archaeological objects, though a conservator should be consulted about environmental requirements for unstable objects. The following general recommendations for care of your collections will help prevent unnecessary damage. • Make an assessment of the condition and vulnerability of your object before you handle it. Use both hands to lift object and support it as near to its center of gravity as possible. Do not pick objects up by projecting parts such as handles, spouts or other appendages that may be insecure. Inspect the surface for powdering or flaking areas and avoid them when handling. Wear plastic or cotton gloves when handling metals in order to avoid causing fingerprint tarnishing. • Keep artifacts away from direct light and sources of heat and away from direct sources of air-conditioning or ventilation. • Do not apply waxes, oils or other products to the surface of objects in an attempt to stop cracking of wood or other organic materials. Contact a conservator if cracking appears active after a fairly stable ambient environment has been provided. • Whenever possible, keep your objects in closed frames, vitrines or cabinets. • When necessary, dust objects very carefully. A clean feather duster is the most gentle tool. When dusting, be extremely careful over splintery or cracked surfaces, as well as those with pigment. Do not use sprays, water or other products to help remove dust or dirt. • If you notice a persistent accumulation of "dust" underneath or around a wood object it could be evidence of insect infestation. Vacuum away the accumulated dust or frass and isolate the object by enclosing it in a plastic bag. Do not disturb the object for several weeks and monitor it to see if more frass accumulates. If so, contact a conservator for advice on the best means of insect eradication for the object. • Do not clean metals with ammonia-containing substances. • Do not attempt to repair broken objects yourself. Improper use of materials can cause damage that cannot be reversed in the future. Contact a conservator for treatment referral.